Roland Brouwer is engaged in research on commons reforestation in northern Portugal in conjunction with the Departments of Forestry and Agrarian Law at Wageningen Agricultural University, the Netherlands, with financial support from the Dutch Foundation for Scientific Research on Law and Public Administration (ReOB). 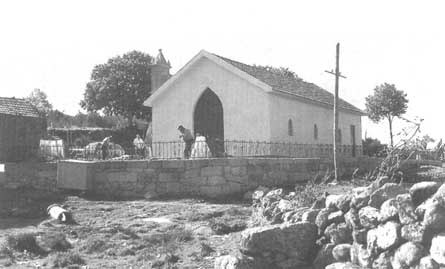 Although the baldios (commons) have changed over time, in many Portuguese villages they still fulfil important functions. The baldios are an ancient tradition in Portugal. The royal rolls by which kings acknowledged privileges during the Middle Ages refer to the baldios. These lands have always been a bone of contention between the rich and the peasants, between shepherds and farmers and between local groups and central authorities (including the forest service). As late as 1875, the baldios comprised more than 4 million ha but, by the advent of the Estado Novo (new state regime) in 1933, usurpation and government-backed individualized privatization had reduced them to some 450 000 ha (or about 5 percent of the land surface of Portugal). These remaining lands are concentrated in the north and the interior of the country. That importance of the baldios is related to their role in the traditional farming system, where they provided construction material, fuel, pasture for goats, sheep and cows and bedding for stable animals. Each year in the spring, the stables were cleaned and the brush, soiled with animal droppings, was spread on the private, cultivated fields of the community members. Thus, the commons were also a source of fertilizer. In many cases individual households held their cattle in communal herds. The baldios were the material base of community organization and a sophisticated structure existed for the administration of common resources. The main components of the traditional management system of the baldios were exclusion, zoning and allocation; only people who were accepted by the community were permitted access. The baldios provided a form of social security for landless poor, who were permitted to pasture cattle and cultivate plots on a temporary basis. Village councils or chamados determined whether certain areas were open for grazing or not, which areas were reserved for the regrowth of brush and which parts were to be used for that year's brush collection. Supervision of the implementation of the councils' rulings was entrusted to elected caretakers or zeladores (see, for instance, Peixoto, 1908; Dias, 1948; 1984; Fontes, 1977; Polanah, 1981). Notwithstanding the importance of the commons for the local population, the new state regime intensified the earlier policies and strengthened the forestation component in particular. About 300 000 ha of baldio were covered by trees, generally Pinus pinaster (Baptista, 1976; DGSFA, 1972; Estevao, 1983),and placed under the management of the state forest service. The forestation efforts effectively curtailed many traditional usufruct rights (based on open wooded grazing land rather than on closed forests) and forced many members of local communities to abandon herding in favour of other occupations, or even to emigrate. The state forest service and its forestation effort were viewed with hatred and resisted by the local populations in spite of the fact that some government compensation was promised when the timber was harvested. In some cases, forestation projects could only be implemented with police protection. In 1966 the civil code was revised to abolish communal property and, for the next decade, the baldios ceased to exist, at least officially. In 1974 a leftist-inspired military coup ended the new state regime. One of the issues to be confronted by the new government was that of the baldios. There were many calls for the devolvement of control to village communities or municipal authorities. Transfer to the municipal councils was opposed strongly by the forest service, which feared that this would lead to the division of the commons, the clearing of the forested areas and the end of reforestation. Such a move would also have reduced the forest area under forest service management from some 500 000 ha (already only a small portion of the country's nearly 3 million ha of forest mostly privately owned and managed) to only 49000 ha. Therefore, me forestry service convoked a working group and charged it with the formulation of proposals that would satisfy local demands and safeguard the forests and the interests of the forest service. This group argued that division of the commons would conflict with the aspirations of the people and clash with tradition. Instead, the group proposed that the commons be maintained as a whole and restored to the village communities. It also suggested an increase from less than 25 to more than 60 percent in the communities' share of the gross revenues from sales of timber and other products harvested (how this revenue was to be distributed was not specified). Thus, after being the "enemy" of the baldios, the forest service became their champion. In 1976 a law was passed (Law 39176) which returned the land to the original user communities. This law returned the commons to the people under two specific institutional prerequisites. The first requirement was that the people organize themselve in user groups. Those members of the population who, according to customary rules and tradition, were entitled to use the common and were considered commoners were joined into a commoners' assembly, which became the formal legal democratic representative of the villagers in common management affairs and the application of financial revenues generated on common land. This commoners' assembly was required to elect a five-member management council, charged with day-today regulation of the exploitation of the commons. A provision was introduced permitting the commoner's assembly to request the state to appoint a representative to the management council (usually the local forest guard from the forest service). As a result, two types of management councils exist: type A, which is composed of five commoners, and type B. which consists of four commoners and a representative of the state. By creating type B, the government intended to provide an opportunity for commoners to receive technical assistance in managing the forest on their land. The aim was to facilitate sound forest management and the development and efficient use of resources and revenues. Presumably, there was also a desire to improve the relationship between the forest service and the local populations after its deterioration during the large-scale forestation under the previous regime. The second institutional prerequisite was recognition of the commoners' assembly and management council by the state. This requirement followed from the fact that restoration of the commons to their former owners entailed the identification of appropriate groups. Because, in some cases, forestation had taken place more than 40 years earlier, it was not always clear which land belonged to which community. Therefore, there was need for a process whereby more than one council could present itself to the state as the legal owner of a given piece of land and whereby disputes could be resolved. This task was assigned to the forest service. The 1976 law was aimed at the restoration of the commons to the commoners. However, since the 1930s important changes had taken place in the countryside. First of all, the commons entrusted to the state forest administration had been forested. As a result, two new resources had been added to the brush and firewood of the traditional grazing land: timber and resin. The 1976 legislation was well aware of the consequence of this development and did not simply bestow the commons on the villages. Instead, it attempted to create a rational management system in which the population's traditional rights could be harmonized with the fact that, through the state forest service's initiative, vast areas had become covered by trees. In the eyes of the law, this new condition of the commons required certain guarantees for professionally guided forest management and for the provision of mechanisms that would help the commoners deal with the monetary wealth expected from timber sales and resin concessions. However, other developments were not taken into account. 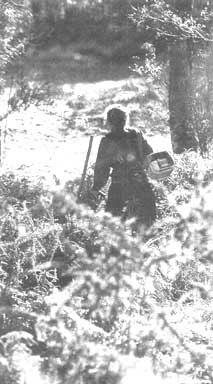 When the forest service started to forest village commons, it temporarily closed areas to grazing and, as a result, shepherds lost their source of income and were forced to abandon animal husbandry. When, after some years, the areas were opened again, there were no people and no animals left. From the 1960s onwards, many people emigrated (temporarily or permanently) to northwestern Europe. Villages that depended on sheep and goat production suffered particularly heavily from this population outflow and risked becoming completely depopulated ghost towns. In addition, chemical fertilizer, once economically you to of reach for the poor peasant population, had come into widespread use. Traditionally, farmers had exploited the brush of the commons as fertilizer for the private fields where they grew rye and maize. Thus, although most of the farmers continued to employ green and brown manure, they were no longer fully dependent on it. This affected the value of the commons and the way they needed to be managed. Finally, there has been a tendency to abandon farming altogether. At the national level, between 1970 and 1990 the share of the working population employed in primary agricultural production declined from 32.4 to 17.9 percent. In the north and the interior, it dropped from 70 to 50 percent (Gaspar, 1981; INK, 1991; CCRN, 1990). The European Community's Common Agricultural Policy reinforces this tendency, as it is clearly aimed at the development of modernized farms and encourages "marginal" farmers to stop producing and accept early retirement. Farm families are diversifying their sources of income and many are employed in industry or construction. All these tendencies together have led to traditional forms of exploitation of the commons becoming less important, while new forms related to the presence of trees have gained in importance. The 1976 law brought about the creation of 637 councils which claimed their commons back from the forest service and the municipal councils (Government of Portugal, 1990; 1992). Notwithstanding the earlier tensions, 84 percent have opted for managing their lands in cooperation with the state (i.e. management council type B). councils are located in two districts: Vila Real and Viseu (Rodrigues, 1987). The following sections of this article concern the municipalities of Campeã and Cidadelhe de Aguiar, both in the Vila Real district. Campeã lies 15 km west of the district capital, Vila Real, in the eastern folds of the Serra do Marao. The municipality has an area of about 2 500 ha. It consists of a wide basin, with a flat bed at 750 m above sea level, and the surrounding mountains which reach as high as 1400 m. The mountain slopes comprise about half of the municipality's area and are officially registered as common property. The approximately 2 000 inhabitants live dispersed in some 18 villages, most of them located along the line that divides the valley from the mountains. The villages are clustered in 12 territories or limites, which enclose both private and common land. Traditionally the inhabitants of each territory held their own village council and elected their own caretakers who, among other things, oversaw the use of the commons within their territory. The territories were autonomous elements within the municipality. Access to the common could be gained in several ways: by being a full member of the community; by tilling fields within the community's territory so that they could be fertilized with manure; or by rent residents of the Montes and Cotorinho villages, for example, rented part of the commons in the adjacent municipality of Ansiães to graze their sheep and goats. The state intervened in the municipal commons in the 1950s and about 625 ha in almost all territories within Campeã were forested while about 200 ha were allotted to individual households. This intervention seriously affected Cotorinho and Montes, and the concomitant restrictions on sheep and goat herding compelled the shepherds of these villages to sell their animals and abandon animal husbandry. Between 1950 and 1960 there was a dramatic decline in the number of animals held in these villages. Deprived of their main source of subsistence, many inhabitants left temporarily or definitively to seek alternative livelihoods in Brazil or western Europe. Consequently, the villages were left to a process of gradual desertion. After 1976, the remaining villagers organized them selves in commoners' assemblies and councils, which served primarily to channel the revenues from fellings in the state-planted forests to the villages, where they were used for the construction of a road. Until then, the villages could only be reached by mountain tracks and were inaccessible to cars. The councils did not interfere with forest management but left this totally to the forest service. They acted as a kind of landlord to the forest service and contented themselves with receiving their share of the revenues (in general, revenues have been used for public works as opposed to being shared among village members). Aveçãozinho. In Aveçãozinho, another village in Campeã in the 1950s the state intervened by allotting 14 ha of the commons to 20 of the 5 8 households in the village and by foresting about 50 ha. The lowest part, another 20 ha, was left as common land to be used by the remaining 38 families. When the nationalized commons were returned to the community in 1976, the remaining commoners established a management council for their administration. Although formally responsible for the totality of the commons (about 70 ha), in reality this council only exercised its authority over the 20 ha that had not been under the control of the forest service. Until this point, state management of the upper part of the commons had been of little benefit to the local population. In the early 1980s, the pine planted on it by the forest service burnt down before reaching maturity. Shortly after the fire, the service replanted some parts with Douglas fir (Pseudotsuga menziesii) and, in 1990, it opened fire corridors. These decisions were taken without consulting the management council. Aveçãozinho's management council concentrated its attention on the lowest part of the commons. As sheep and goats had never played an important role in the village economy (Aveçãozinho was traditionally a cattle farming area) and the cutting of shrubs and heather to fertilize private fields was done with great care in order to allow the growth of seedlings, the area had become covered by pine which was either planted by the people themselves or which regenerated naturally from the contingent state forest. Although brush still plays an important role in the local farming system - all farmers but one collect a cart-load once or twice a week for their stables - brush mowing is no longer regulated. 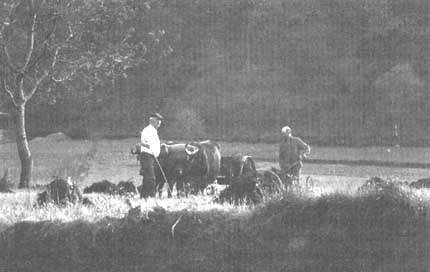 In the past, both the total area available for mowing and the amount each household could collect were limited by the village council. Every year, the community would allocate each household a fixed area for that season's brush collection (Peixoto, 1908). This is no longer the practice; however, the abandonment of traditional restrictions has not affected the system's sustainability and one can easily observe that brush growth is not in serious danger anywhere. Apparently, both the existence of private brush lands as a source of fodder and the availability of chemical fertilizer have rifled excessive pressure from the common brush area. Grazing, the second traditional form of common land use, has also become less important. In 1941 it was estimated that only 5 percent of the villagers' cattle feed came from the communal area and, nowadays, only three households take their cows regularly to the common and only during a short period. On the other hand, the common has gained importance with respect to fuelwood. With the increased tree cover since the 1950s, the management council's main role is to organize the distribution of fuelwood to individual households. Each year in summer, it marks the trees and distributes them through a lottery system among the commoners. This system is a direct copy of the earlier system which was used for the allocation of brush. To summarize, it could be said that, although Aveçãozinho's council does not exercise any of the traditional management functions (e.g. the regulation of grazing and brush collection), it still continues traditional practices by executing its new function of fuelwood distribution using the very procedures that were handed down through the generations for the distribution of brush. However, this tradition is maintained with difficulty. In the spring of 1993, the council refused to organize the allotment of trees that had been damaged by heavy snowfalls and storms. Since it failed to take any action, one of the villagers who had a tractor proceeded to collect most of the damaged trees, much to the resentment of the other members of the community. Later that year, the council decided to sell about 40 pine trees for timber and to use the revenue from this sale to provide iron plate covers for the irrigation channels that crossed the village road. In Cidadelhe de Aguiar, 20 km to the north of Vila Real, the situation is quite different. First, the village disposes of a 700 ha common, much larger than that of Campeã Second, it has assumed full responsibility over its area and so the state is no longer represented on the management council. The common was forested by the state between 1945 and 1965, a heavy blow to the local economy which depended almost totally on sheep and goat farming. As a result, many inhabitants left to look for a living abroad. Today, however, things have changed. The forests, which once forced local residents to emigrate, now offer large profits to the villagers. The community of 135 commoners receives about US$8 000 annually from the sales of resin alone. Further, it earns money from occasional thinnings and can expect the revenue from the first final cuts within a few years. All together, between 1986 and 1989 the council administered an annual gross revenue of $25 000. This has been invested mainly in infrastructure for the public's benefit: about $46 000 have been used for improving the irrigation system through the construction of a new, 9 km cemented water channel and the replacement of open secondary channels with concrete tubes. As a result, water losses during transport from the source to the fields have been reduced considerably. Further investments are being made to improve the village amenities, such as the construction of footbridges and a community centre. The council has also contributed to the construction of a football field (on common land) and subsidizes club membership fees for the younger players as well as paying for their uniforms and equipment. Because the council acts independently of the state, it has to assume all the tasks that would normally be carried out by the forest service. It must look after the stands, determine whether thinnings or final fellings are necessary and organize the auctions where lumberjacks buy the standing timber and specialized enterprises compete for the concession to collect resin. Regeneration of the stands is often left to spontaneous regrowth from the seed still present in the soil. If the council chooses to replant, it contracts agricultural labourers who are paid to do the job. Cidadelhe de Aguiar's council acts as a modern forest entrepreneur. The only obligations it has is to maintain the forest cover according to the legal requirements and to pay the forest service its 30 percent share in the gross timber revenues. The forest service's job, on the other hand, is to provide advice and ensure that the council obeys general forest management guidelines. The common thus serves to improve or sustain the village's vitality However, the extent to which that function can be executed successfully depends not only on the community itself but also on outside factors. For example, the management council spent $ 19 000 for the construction of a community milking shed because the milk cooperative in the region agreed to provide the machinery. However, in the meantime, EC milk production quotas were implemented and the cooperative is no longer willing to keep its part of the agreement. In this manner, a local initiative is being suffocated by policies formulated at higher levels. After the publication of the 1976 law, 637 management councils were created. However, many have since ceased to function or have been dissolved; today only 132 are still operational and only about one-third of the commons (141 000 ha) are actually administered by local communities (Government of Portugal, 1990; 1992). One of the causes of this decline is undoubtedly the political uncertainty that has surrounded the common land question (see Ostrom, 1992). Since 1976, 17 bills have been presented to parliament, aimed directly or indirectly at the dissolution of user communities and the transfer of their management powers to the local authorities, the municipal councils. Until recently, a lack of consensus among the most important parties in parliament impeded the passage of all these bills but, in 1993, a compromise was reached and a new law (Law 68193) was published on 4 September 1993. It is still early to evaluate the impact of the new legislation on the commons but some speculation is possible. First, contrary to the earlier bills, the new law leaves intact the idea of local administration by the commoners. The management councils are to consist of community members only, without a state representative (art. 20). However, all councils in which the state and communities currently cooperate (type B) will continue to function as long as both parties agree to perpetuate their relationship (art. 37). The most important change in the administrative structure was the creation of a new commission, charged with supervision of the management council's financial administration (art. 11). Other important modifications concern the protection of common property against privatization and control by state institutions. Where the previous law prohibited any alienation of common land, the new law allows: the delegation of administration to another entity (the municipal council or a relevant government office - for instance, the forest service) (art. 22); expropriation by the state for the public's good; privatization for the benefit of housing or industry (art. 29); and extinction following a unanimous decision by the commoners themselves or after three years of "ostensive abandonment" (arts 26, 27). These measures imply a serious threat to the continued existence of Portugal's commons. There is already a widespread practice of common land allocation for housing construction; for example, during the last decade in Aveçãozinho eight plots of an average of 400 m² were sold for this purpose. Further, even in agriculture it is not abnormal to leave land unused. In the south of Portugal, large estate owners practice fallows of seven years or more on private fields. Particularly in villages that are threatened by emigration, the temporary departure of younger residents, who leave the village to the elderly who live off pensions instead of farming, and the concomitant temporary abandonment of common land may turn the commons into an easy prey for local community or municipal authorities. Finally, it seems very odd that common property should be subject to a restriction that does not exist for individual private property. On the other hand, the new law confirms some already existing and generally accepted practices. Authorization to expropriate small parts of the commons for housing coincides with an age-old practice: in the Campeã municipal records, which date back to 1890, there are several examples of the alienation of common land for the construction of housing for villagers without sufficient land of their own. Further, in a survey carried out in Campeã, 38 out of the 41 household heads interviewed agreed with the expropriation of the commons for this purpose. However, only 24 were in favour of land sales to people from outside the municipality. Most of those interviewed also endorsed the expropriation of land for industrial development. Apparently, in this respect the bill can count on the support the commoners themselves. However, the commoners spoke out clearly against the abolishment of the commons (Brouwer and Kwakkenbos, 1993). The commons in Portugal still exist; after 40 years of state control they were restored to the population in 1976 and, in many villages, people created commoners' assemblies and management councils in order to undertake the administration of their age-old domain. However, during the years that passed between state intervention and the satisfaction of their demands, the people themselves and their commons had changed. Many had temporarily been workers in foreign industries and some had abandoned farming altogether whereas others had modernized their agricultural practices and turned to the use of chemical fertilizers and liquid manure. From a pasture for sheep and goats and a source of green and brown manure, their commons had turned into a source of market-able timber and resin. Management no longer required the regulation of grazing and brush collection, but rather the organization of auctions; the achievement of good market prices; negotiations with concessionaires, traders and the forest service; and the investment of the revenues earned for the benefit of the community. In all cases, the commons now provide villages with infrastructure that they obviously could not obtain through other means: covered irrigation channels, improved irrigation systems, better amenities, etc. The commoners were evidently able to employ the instruments of the 1976 law in a way that benefited their communities. In that perspective, the danger of the commons' abolishment and alienation engendered by the new law would appear to be a step backwards rather than an improvement. Baptista, F.O. 1976. Portugal 1975. Os campos. Lisbon, Affrontamento. Brouwer, R. & Kwakkenhos, C. 1993. A questão dos baldios: ser ou não ser. Poder Local, 126: 42-50. CCRN. 1990. Os sectores agrícola e agroindustrial na região de Trás-os-Montes e Alto Douro. Porto, Portugal, Comissão Coordenadora Região Norte. DGSFA.1972. Algunos elementos estatísticos relativos ás sua actividades. Lisboa, Direcçao Geral dos Serviçios Florestais e Agricolas. Dias, J. 1948. Vilarinha da Furna, uma aldeia comunitária. Lisboa. Imprensa Nacional, 1983. Dias, J. 1984. Rio de Onor. Comunitarismo agri-pastoril, 3rd Lisbon, Editorial Presença. Estêvão, J.A. 1983. A florestação dos baldíos. Análise Social, 19: 1157-1260. Fontes, A.L. 1977. Etnografía transmontana II - O comunitarismo de barroso. Montalegre, Portugal. Gaspar. 1981. Portugal em mapas e números. Lisbon, Livros Horizonte. Government of Portugal. 1940. O plano de povoamento florestal. Lisbon, Ministry of Agriculture. Government of Portugal. 1990. Duarte, C. Intervenção ; discussão do Projecto de Lei 532/V. Grupo Parlementar do Partido Social Democrático, Assembleia da República, Lisbon, 30 de November de 1990. Gobierno of Portugal. 1992. Condesso, F. Intervenção. Grupo Parlementar do Partido Social Democrático. Assembleia da República, Lisbon, 2 de July de 1992. INE. 1991. Censos 91. XIII recensemento da população, III recensemento geral de habitação - norte; resultados preliminares. Lisbon, Instituto Nacional de Estatística. JCI.1941. Plano geral do aproveitamento dos baldíos reservados. Volume II, Os distritos de Viana de Castelo e Vila Real. Lisbon, Ministry of Finance. Ostrom, E.1992. The rudiments of a theory of origins, survival and performance of common-property institutions. In Bromley, D.W., Feeny, D., McKean, M.A., Peters, P., Gilles, J.L., Oakerson, R.J., Runge, C. & Thomson, J.T. eds. Making the commons work: theory, practice and policy. San Francisco, California EE.UU., Institute for Contemporary Studies Press. Polanah, L. 1981. Comunidades camponêses no parque nacional da Peneda Gerês. Lisbon, Serviçio Nacional de Parques, Reservas e Património Paisigístico. Rodrigues, M. 1987. Os baldios. Lisbon, Caminho.